E2314 RC Aircraft Ignition Switch and Light Controller | Locus Engineering Inc. The E2314 Ignition Switch Light Controller is an opto-isolated ignition shutoff switch with a navigation light controller for gas powered R/C aircraft. The ignition switch is turned off if the servo pulse period exceeds a threshold after a 2 second delay. The ignition is switched off at the servo pulse period halfway point and a polarity jumper selects between decreasing servo pulse (jumper on) or increasing servo pulse (jumper off). 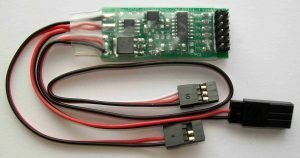 The switch is rated at 12Amps, 30V while the module is powered from a 4V to 12V servo channel from the receiver. The light controller provides both static red & green wingtip and white & white wingtip and red tail strobed navigation light outputs powered through current limiting resistors matched to red, green, and white LEDs for 20mA @ 5V. The strobed outputs are switched on with the ignition for a realistic aircraft look. LEDs are easily connected to the paired male pins on the board periphery using 2 pin JR style connectors. LED cables are available separately at custom lengths.